A while back, a few of my tweets were chosen to be in a book called The Bigger Book of Parenting Tweets. That compilation was put together by Kate Hall, Norine Dworkin-McDaniel, and Jessica Ziegler, which is how I came to know these incredibly cool people. Norine and Jessica have just published another book, Science of Parenthood: Thoroughly Unscientific Explanations for Utterly Baffling Parenting Situations which is full of cartoons and funny stories and charts and graphs and stuff. They use science as a jumping off point to make funny observations about parenthood. It’s a really good book. Click the picture and it’ll take you to Amazon and you can buy it. I’ll wait. Okay, you’ve ordered it? Cool. So what immediately struck me about this book was that there was no way that anyone would get the set-up of these jokes. There are all these oblique references to laws and principles and such that ordinary people wouldn’t know. Show of hands, who knows what Hooke’s Law is about? (Sees one hand; no, it has nothing to do with Peter Pan; sees no hands.) Exactly. Yet I’m reading all these reviews and everybody thinks the book is really funny, so I guess maybe you don’t need to completely understand the joke setups for them to work. But I figured I’d go ahead and dig deeper into one of these, so you can see what you’re missing. A baby will exert a gravitational pull on a new Mom so intense that despite numerous text messages assuring her that the baby is, in fact, still breathing, she will need to race home to check for herself. Alright, so you think that’s funny, because it’s true, right? But why did they call it “Mach’s Principle”? Anyone? Anyone? Mach was trying to explain centrifugal force. 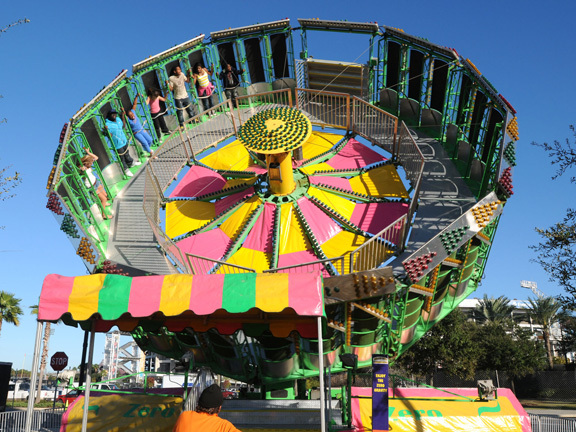 You get in that big wheel-shaped thing at the fair, and it spins around and you are pinned to the wall, and then it tilts up and you stay pinned to the wall instead of falling toward Earth. Why is that? You might not have noticed, but Earth is really huge. Its hugeness gives it a giant gravitational pull. It’s strong enough to keep the moon in place. But yet that silly spinning wheel thing at the fair is able to defeat it. Why? The really funny thing is that there isn’t a great explanation. Newton just threw up his hands and said “law of nature.” Mach thought that was kind of lame, so he came up with this explanation that it had to do with frames of reference. I’ll try to explain his thinking. When you are in that wheel thing, you can look across at the other people and they don’t seem to be spinning, right? Within your frame of reference, they aren’t spinning. Everyone is just standing in exactly the same place. Kind of like how we don’t think of other things on Earth as spinning, even though we know from school that the whole damn Earth is spinning. Within our frame of reference, we’re just sitting still. Okay, so that’s cool, but then why can’t you walk across the wheel to the other side? If it’s spinning fast enough, you probably can’t even lift your arms from against the wall. So within your frame of reference, there’s this massive “force” pulling on you. Suppose that wheel was floating free in space and there was nothing else in the whole universe. Would you still feel that force? Think about it. The motor that’s driving the wheel has nothing to “hold on to” right? So it’s spinning relative to you, and you’re spinning relative to it. But you’d be able to walk across that wheel in that case, right? Everyone could step away from the wall and walk to the middle and look down at that big motor which is just spinning away, and then look at each other and realize they have no air to breathe and die. Mach’s Principle therefore, is that stuff “out there” defines the forces we feel “in here.” And so if you go look at the joke (from the book—remember, this is my book report), it’s clever because the force “out there” is not the distant stars, but rather the baby. And the “in here” is not our inertial frame of reference, but rather our personal sense of where we need to be. So there’s a really clever joke-inside-the-joke there that you didn’t even get! But now you do. So what I’m saying is, this is a really funny book. But it’s even funnier if you take the time to go look up the laws and principles they are referencing, because there’s a whole ‘nother level of brilliant waiting there for you if you do! I know you already bought the book because I told you to up top, but if you now want another copy to give to your friends, here’s the link again. ← Here we go again…. My book Entropy is now available on Amazon in both paperback and Kindle editions. Get a Free Novel when you Sign Up! Buy my book Entropy on Amazon!